While shopping for Christmas, a sticker on one of the windows caught my attention. It said “Guide Dogs Welcome”. I had noticed a similar sign a few months ago while in Denver on vacation. I don’t know where these business owners even found the signs. Maybe it was before 1990 when ADA was passed, who knows? The law states all service animals are to be allowed in any business serving the public. There is no law stating they must be certified and no one can require the individual to disclose their disability in order to justify the service animal. They are only allowed to ask if the animal is an assistance or service animal. And the misconception that guide dogs are the only service animal certified as an assistance dog is erroneous. As more doors open for people with disabilities the duties of service animals constantly broaden to accommodate new freedom of independence. Almost everyone is familiar with guide dogs for the blind. They have been around since post WWI when they were developed and trained in Germany for veterans who were blinded during the war. Now, they exist all over the world. They are easy to identify with their harness and handle. For the visually impaired they supply independence, freedom and companionship. Sixty years later we have advanced with training methods to assist many more disabilities. Most, however, are not familiar with the extensive variety of these highly trained and specialized dogs. Some people mistake them as pets and do not realize that years of training have gone into these valuable dogs. I have attempted to list the most common service dogs but training methods advance constantly and I am sure someday there will be a service dog for almost any disability. With the success of the Seeing Eye programs, trainers began to explore other disabilities that could benefit from the dog’s amazing ability to help people. The next step involved developing a hearing dog. These dogs are trained to basically convert noise into touch. They respond to everyday sounds such as the telephone, the doorbell or even the owners name being called by rubbing, nose nudging or even tugging on its owner. In an emergency such as a fire alarm, the dog will respond by giving more agitated alerts, such as actually jumping on the owner. The hearing dog can also be taught sign language. Service dogs assist physically disabled people by performing all sorts of assistance tasks such as opening doors, turning on lights, assisting in transferring by bracing, even pulling their owners wheel chairs up steep ramps. You can often recognize them by their backpacks full of useful items for their owners. Seizure detecting dogs are the newest assistance dogs. These dogs are trained to recognize behaviors associated with an individual’s seizures. The dog can be trained to get help or stay with the person if needed. Alert capability is a natural occurrence where the dog “alerts” the owner that a seizure is about to occur. True alerting behavior is usually the result of the dog and human developing a very close bond. This alert capability enables an individual with seizures to locate a safe place before the seizure actually occurs. 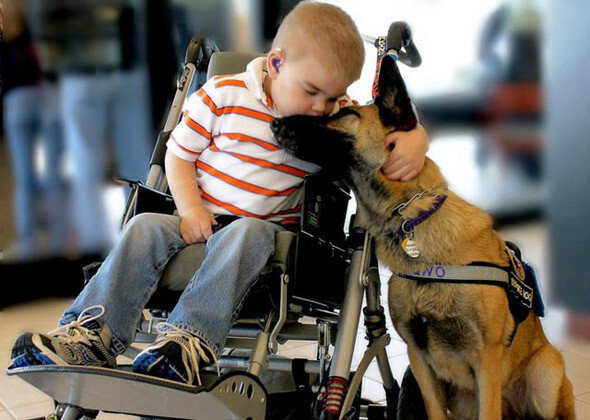 Therapy dogs improve emotional and physical health simply by interacting with a person. Health care professionals have found that petting a dog can reduce stress and lower blood pressure and pulse rates in some individuals. There are many volunteer organizations throughout the country that help train volunteers to take their dogs to nursing homes, hospitals, mental health centers and prisons on therapy missions. These programs allow access to animals for a segment of the population that otherwise may not have access to animals. There is even a class of service dogs called “combination dogs.” These dogs are trained to assist people with multiple disabilities that include visual impairment. In addition to work as wheelchair support dogs, combination dogs act as hearing dogs and guide dogs. They are trained to identify barriers to mobility like traffic, cracks in the sidewalk, overhanging branches and obstacles in the path of the owner. And, of course the guide training can also help the owner locate many items using the “find” command (find the door, find the elevator, find the comb). I would like to share a few last words on some do’s and don’ts when you see someone with an assistance dog. While it’s perfectly fine to talk to the person about their dog, refrain from petting or talking directly to the dog. It will distract the dog from its work. The same holds true for feeding treats or attempting to play. Once the dogs are home their owners have built in play and cuddling time for them. Being an assistance dog is a job that these dogs love to do but keep in mind it is a structured training that has taken years to accomplish. This entry was posted in Society and tagged Disability, Dogs.